Thomas Pieters fired a bogey-free, seven-under-par 65 to take the halfway lead in the Abu Dhabi HSBC Championship on a day when the all-star three-ball of Tommy Fleetwood, Rory McIlroy and Dustin Johnson also underlined their title credentials. Pieters and his playing partner, EurAsia Cup teammate Ross Fisher, set the tone for a low-scoring day, with the Belgian laying down the clubhouse target of 12 under par 132 , while Englishman Fisher posted a round of 67 to sit two shots back on 134. Spain’s Jorge Campillo then birdied the final two holes for a superb 64 to close the gap at the top of leaderboard to just one shot, while another EurAsia Cup player, France’s Alex Levy, joined Fisher in a share of third place. Defending champion Fleetwood, celebrating his 27th birthday, then made it a three-way tie on ten under par 144, courtesy of a four under par 68 in the marquee afternoon group alongside four-time major champion McIlroy and World Number One Johnson, both of whom made significant strides up the leaderboard to set up a fascinating weekend at Abu Dhabi Golf Club. McIlroy rolled in a 30ft eagle putt on the last for a round of 66 to move to nine under par 135, the same mark as Englishman Paul Casey, a two-time champion in Abu Dhabi, who also finished with a three on the par five 18th for a round of 65. Johnson is a further shot back on eight-under 136 after a bogey-free 64 and the American is nicely poised for weekend charge similar to 12 months ago, when he was 12 under par for the closing 36 holes to finish one shot behind Fleetwood. Players with 36-hole tallies of one-under-par 143 and higher missed the cut. They included five Scots, including Paul Lawrie who shot 74-72 for 146. A double bogey 6 at the 16th in his first round put him under pressure today when he needed a sub-par round to survive. Instead the Aberdonian, who had tour pro son Craig as caddie, birdied the eighth, 10th and 12th but bogeyed the second, 11th and 15th. Richie Ramsay (137) and Stephen Gallacher (140) were the only Scots to make it through to the weekend action. Tommy Fleetwood: “I said yesterday, I think however long my career is, I'll struggle to get a better three-ball in my life. It was always going to be enjoyable. Dustin shot the most stress-free 64 and Rory shot the most stress free 66 you'll ever see. For me, it was a bit more stressful for me but I really holed out well, so I just kept going. 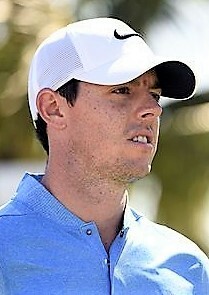 Rory McIlroy: “That was very satisfying. I've d1one quite a bit of work over the off-season and worked on my swing and a couple little tweaks here and there. They seem to have paid off already. A couple little swing thoughts that I still have but it's nice to see that the work I put in on the range can translate onto the golf course, and that's been a great thing to see for me over the last two days. Dustin Johnson: “I felt pretty good out there today. I did everything really well. I mean, it was a pretty easy 64. I hit it really well. I had a lot of great looks. I didn't really hole any putts, really, until I made two nice putts on 17 and 18. But other than that, it was just really solid all day long. Hit a lot of great shots. Had a lot of looks at birdies, which is what I need to do the next two days if I want to have a chance to win on Sunday.